Elly and Brinley have turned a year older. Elly is now six and Brinley is now three. Since their birthdays are only a few weeks apart I enjoy combining them. 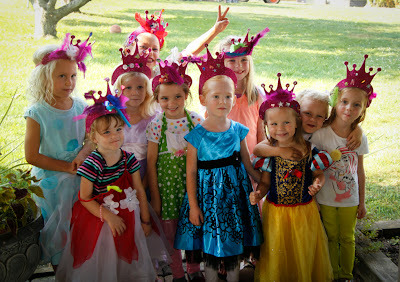 They of course wanted a princess party, what else would two girlie girls expect? My wonderful neighbors allowed us to have the party in their beautiful pavilion. It was wonderful, simple and not over the top. We had a tiara craft, pin the crown on the princess, mac n cheese, veggies and dip, opened gifts and had cake. It was the perfect amount of time.